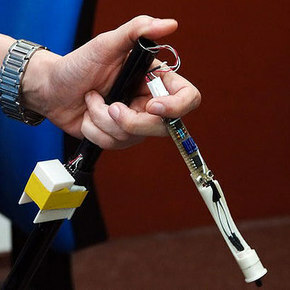 A pressure sensitive cane able to monitor the user’s gait could offer a non-invasive insight into their rehabilitation progress. The cane is equipped with pressure sensors that track how much weight the user puts on the cane, thereby monitoring their need for the assistive device. The data is transmitted via Bluetooth to a paired device, and the embedded electronics do not affect the ergonomics of the cane. The information collected by the smart cane can be used by therapists to track patient progress in an inexpensive and non-invasive way.